Combat correspondents provide a unique perspective on what it's like inside the U.S. Marine Corps. These Marines gather information for news and feature articles much as civilian journalists do, and also conduct public relations efforts. So while these Marines may not be the first line of defense in battle, their job in the unit is key, because it may be the only way to document for a civilian audience what happens in a combat situation. And, these specialist are charged with presenting the official Marine Corps message or point of view for civilian publications and broadcasts. This job is categorized as military occupational specialty (MOS) 4341. This is a primary MOS, open to those from the rank of private all the way up to master gunnery sergeant. In addition to gathering news for print publications and television news programs, these Marines act as media liaisons, answer queries from civilian media representatives and conduct community relations programs. They produce print articles and photographs and edit internal newspapers and magazines. Combat correspondents at the rank of staff sergeant and higher may receive a designated billet of public affairs chief, by virtue of seniority. The PA chief supervises and trains other Marines as combat correspondents, and oversees enlisted Marines assigned to the PA office. They'll also serve as an adviser to the public affairs officer. 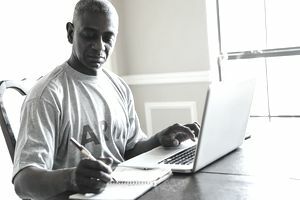 If you want to enlist in this job, you'll need to take the Armed Services Vocational Aptitude Battery (ASVAB) tests, and receive a general technical (GT) score of at least 110, and a verbal expression (VE) score of 45 or higher. You'll be interviewed by and receive approval from a public affairs officer or non-commissioned officer, and complete the basic public affairs specialist-writer course at the Defense Information School. Alternately, you can demonstrate satisfactory performance per through managed on the job training (MOJT) at a command public affairs office or an Armed Forces Radio Television Service (AFRTS) facility for a minimum of six months. There are some aspects of this job (mainly the combat part) that don't have a civilian equivalent. But that doesn't mean there aren't any post-military career options for you if this is your MOS; quite the opposite. You'll be able to find work at civilian news and publishing organizations, and television stations once you've separated from the Marines. The skills and training you receive in the Marines will allow you to pursue work as a reporter, editorial assistant, photojournalist, editor or public relations specialist. What Is an Assault Amphibious Vehicle (AAV) Crewmember?